Why we love 'em: There's a reason bananas are the most popular fruit in the United States -- they're delicious! They're sweet, but not too sweet, and they're soft, but not too soft. And bananas are fun to eat. Weeee! The Magic ingredient: Potassium. Bananas are one of the best sources of this essential mineral. Potassium helps us to maintain normal blood pressure and heart function and helps prevent cardiovascular disease and stroke. How to enjoy them: With a drizzle of honey, chopped up and mixed into a Jell-O SF pudding cup, or frozen with a touch of Hershey's Lite Chocolate Syrup. Why we love 'em: These hairy, brown babies may not be much to look at, but cut one open and you'll find that the outside is much different from its gorgeous inside, which is a lovely, brilliant, bright green. And they taste great, too. Magical Properties: Studies show that kiwi may protect against respiratory symptoms associated with asthma, such as wheezing and shortness of breath. Kiwi has long fascinated researchers because of its amazing ability to protect DNA in the nucleus of human cells. It's also loaded with vitamin C, and a good source of vitamin E, vitamin A and fiber. How to enjoy 'em: Top sliced kiwi and strawberries with nonfat plain yogurt, make a tropical fruit salad or salsa, or simply peel, slice and eat plain. Why we love 'em: Apples are sweet, crunchy and refreshing. 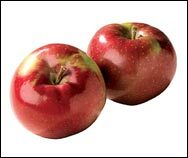 And, because apples are a good source of fiber, they not only keep the doctor away, but they keep hunger at bay as well. The Magic ingredient: Many of the phytochemicals found in apples, including quercetin, catechin, phloridzin and chlorogenic acid, are strong antioxidants. These antioxidants serve to help prevent cancer, heart disease, asthma, and type 2 diabetes. How to enjoy 'em: Sliced w/a Tbsp. of all natural peanut butter, baked using diet black cherry soda, or chopped up into a carton of Yoplait Light Apple Turnover Yogurt. Why we love 'em: Blueberries are jam-packed with nutrients and great taste, yet are very low in calories. These tart 'n tangy colorful circles of flavor are delicious in everything from pancakes to muffins to oatmeal and yogurt. The Magic ingredient: Antioxidants. All fruits contain antioxidants, but studies show that blueberries contain the highest antioxidant content of all. This makes them great at destroying free radicals that cause disease and signs of aging. How to enjoy 'em: In cold cereal, warmed up in a bowl of oatmeal, or as part of a BlueBran Vitalicious VitaTop. Why we love 'em: Grapes are awesome. They're fun to pop in your mouth, and have a great sweet, juicy crunch to them. The Magic ingredient: Boron and flavonoids. 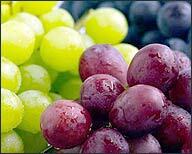 All grapes are a great source of boron, a mineral that may help ward off osteoporosis. Grapes also contain beneficial compounds called flavonoids, which are phytochemicals that give red grapes their bright color (note: the more vibrant the color, the more rich the flavonoids). These flavonoids have been shown to decrease LDL (bad) cholesterol. How to enjoy 'em: Frozen, in the form of a glass of wine, or straight off the vine. Why we love 'em: These beauteous red friends are little bits of berry bliss. Sweet and refreshing, they're one of the most delicious fruits ever. And lucky for us, they're also super-low in calories. The Magic ingredients: Vitamin C. Strawberries actually have more of the stuff than oranges. Strawberries also contain ellagic acid, a natural cancer-fighting chemical. Researchers have found that this compound is a potent inhibitor of such carcinogens as tobacco smoke and nitrosamines. How to enjoy 'em: Dipped in Hershey's Lite Chocolate Syrup, sliced in oatmeal, or on top of Dreyer's Slowed Churned Ice Cream in Vanilla or Strawberry. Remember, June 3rd is National Egg Day. Looking for a way to keep yours fresh? Check out this cute little item! Share this "fruit-ful" email with everyone you know and like. Click "send to a friend" NOW!